An American agent, under false suspicion of disloyalty, must discover and expose the real spy without the help of his organization. The first film in the long-running Tom Cruise franchise. Ah yes, this is the movie that displays stunning technical accuracy regarding e-mail addresses. What, there's something wrong with "Max@ Job 3:14" as an email address? Missing Cinnamon Carter (Barbra Bain) -- Fail! The setpiece action scenes are good, too many draggy parts, though. I just watched it last night and it seems like three movies competing against each other. 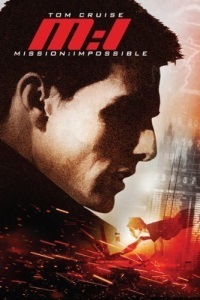 One is the studio wanting to do a remake of a fondly remembered TV series that they happen to own the rights to, the next is De Palma doing his normal De Palma thing of cramming Hitchcock and Film Noir elements into every movie he makes and the last is Tom Cruise wanting to create new franchise for himself. So it's got the required tropes from the show, the recordings and the masks and such, and then all of the show-offy canted angles and crazy focus pulls like Blow-Out but also the flashy action Cruise centered set-pieces that the series is now known for. Even as discordant as the tone is, it's still a fun movie and the action sequences are great. The vault break-in still makes no sense but is wonderfully tense and just so precisely directed. The train-helicopter chase again makes no sense and the '90s CGI looks pretty bad but it's still so over-the-top and fun. It's weird to think that Voight was only a couple of years older then than Tom Cruise is now but he looked so unbelievable dragging himself along that train roof. It's hard not to laugh at the computer screens and searching Usenet for clues but that all looked so spiffy and high-tech when it came out. It was fun to see the '96 iteration of Netscape on his laptop. M:I was the first movie I went to see by myself when I was in high school. It impressed me enough to go see it a second time. I agree with octothorpe above. It does come off as several different movies in one. It actually works for me because it comes off as a glossy high-budget version of Ronin. I always like to see it when actors are in big movies in small cameo roles like Emilio Estevez and others on the ill-fated IMF team at the beginning. I've fantasized about making a movie where every speaking role is played by somebody at least "hey, it's that guy!" level, higher if possible. You know that De Palma shot a much gorier death for Estevez that got cut for the PG-13 rating. I mean Rob Bottin was working on the film; I'm sure that there's a shot somewhere with poor Emilio impaled on spike at the top of the elevator shaft. amazing timing for this post. I just finished watching "Lessons from the screenplay" about this movie. The vault break-in still makes no sense but is wonderfully tense and just so precisely directed. The train-helicopter chase again makes no sense and the '90s CGI looks pretty bad but it's still so over-the-top and fun. How do these things "make no sense"? I feel like a lot of people lob this kind of criticism at scenes in a movie and I am always left wondering what they are talking about. Do you mean you don't understand why the characters made the choices they made? Or you don't understand the scene-to-scene sequence of events? You can argue that maybe they should have just used their mask technology or whatever to impersonate Donloe instead of going through that rigamarole of poisoning him and faking the fire alarm. There was nothing in that movie that indicated that they had the voice impersonation technology at that point so they couldn't get past the voice recognition scan, never mind the retinal scan. You could argue that Job should have never agreed to make the exchange on a train, but Ethan was holding all the cards at that point. I'm not sure he had much of a choice if he really wanted his money. I really like the movie. Yes, haha, netscape and typing "internet access" blah blah blah. I find the movie much more cohesive than others here appear to. When Tom Cruise commits 100% to a role and buys into the world he's in, there's nothing else like it. This movie is an excellent example of that. When Tom Cruise commits 100% to a role and buys into the world he's in, there's nothing else like it. You can either have serious buy-in to the world, or you can have a helicopter in a tunnel. Still my favourite De Palma movie - and I count myself as a De Palma fan. I don't care what anyone says! What I never understood was, what were those spiky sticky-outy dagger stabbers doing at the top of the elevator shaft that Emelio's career died in? They were placed/triggered by Job to kill Jack in the elevator. I will simply never forgive this movie for making Phelps a traitor. It felt so unnecessary. Why couldn’t this just be someone else rather than someone tv watchers had affection for? I've just started listening to "The Bechdel Cast" podcast, and their Mission Impossible episode was pretty fun. It really was a bizarre decision - the only people familiar enough with the Phelps name/character are the people who would be most offended by the writing choice. Whereas most of the 1996 movie-going target audience probably knew nothing about Mission Impossible besides that it was a spy show with catchy theme music, so Jon Voight's character's name was completely irrelevant to the effectiveness of the plot twist. Like, guys, that's not how fan-service works. Also sadly funny (as pointed out by the Bechdel Cast podcast), that this is the only movie of the franchise where the female lead is the same age as Cruise -- and it's only because it's a fake-out since her character is actually paired with Voight in the traditional Hollywood 'male love interest old enough to be the female character's father/grandfather' age ratio. That as the franchise goes on, they develop a bunch of recurring male characters, but introduce and dispose of new 30-something women for each movie. In fairness, MI6 does bring back Rebecca Ferguson from MI5 and Michelle Monaghan from MI3 and MI4. Thandie Newton is 10 years younger than Cruise. Michelle Monaghan is 14 years younger than Cruise. Rebecca Ferguson is 21 years younger than Cruise, which is at that limit you're talking about. The real sexual chemistry in MI1 is between Cruise and Vanessa Redgrave. I wish she would have featured in more of the movies somehow. That as the franchise goes on, they develop a bunch of recurring male characters, but introduce and dispose of new 30-something women for each movie. Renner was also discarded without explanation for MI6. In every MI film up until MI5, they kill the "big bad guy" as well. They wanted Renner but he was too busy not appearing in the Avengers. I was on the bus when I typed that and couldn't link easily but it's actually true, they started M:I-F without a script and couldn't promise Marvel when Renner would be available for Infinity War (which he also wasn't in).